While it might look so easy for some, a lot of effort goes into putting a solid daily weather report. That task used to belong to Michelle Ong, ANC's former weather anchor, mostly seen on Primetime and The World Tonight. 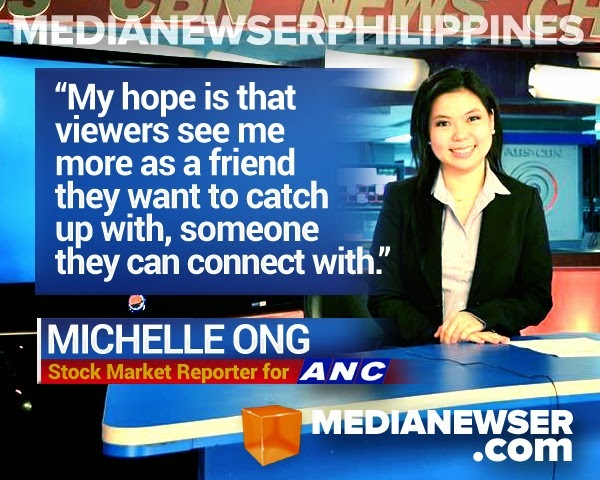 She was recently promoted to do stock market reporting for the cable news network — an indication that the powers that be at ANC are taking notice of her talents. "This is a very exciting next step in my life — a goal I've been chasing for years, and now I am here," says Michelle. Behind the scenes, Michelle also works as executive producer for both Inside Business and News Now. "As much as possible, I try to always do the best I can in whatever I do," she says. "You know what they say, your last project or in our case, last newscast, is your updated resume." 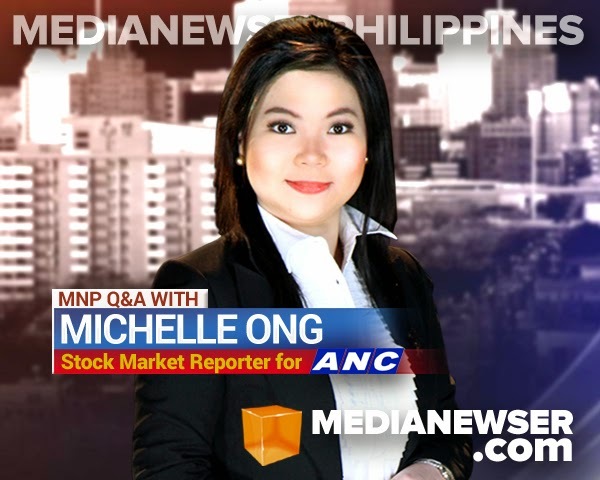 For our first MNP Q&A this 2015, we're putting the spotlight on one of ANC's rising media newsers and talk about her career as a journalist, her thoughts on weather reporting, her new role as stock marker reporter, and many others. Be sure to be part of the discussion on Twitter by tweeting us @medianewserphil or posting your comments below or on our Facebook page. Guiding Principle: "If you’re bold enough to ask… the Universe will be bold enough to give." A bit of introduction: Who is Michelle Ong off-cam and on-cam? I would like to think she is a wonderful person. A Disney Princess at heart who believes there is goodness in everything. She believes in magic and destiny. Her best quality (in my humble opinion) is her will made of steel. When she sets her mind on something, she won’t stop until she gets it. She may be "makulit" at times, but I’d like to think it’s one of her endearing qualities, too. [laughs]. Off-cam, she loves to sleep, eat and be merry. Chika time is a must! Shopping also recommended to bring extra cheer. On non-work days, you’ll probably find her eating, reading or connected to her iPod as she drifts off to wonderland. And she loves punch lines both giving and hearing them! How did you first get involved in the local news industry? Tell us a bit about your first foray in the industry. Technically, my first job was with GMA, as part of their Sales & Marketing team. It wasn't the dream job, but at that time, I thought it wasn't so bad to have one foot in the door. It only took me a day to realize it wasn't for me, even the waiting part didn't feel right. So as you may have guessed: I didn't make it to Day 2. 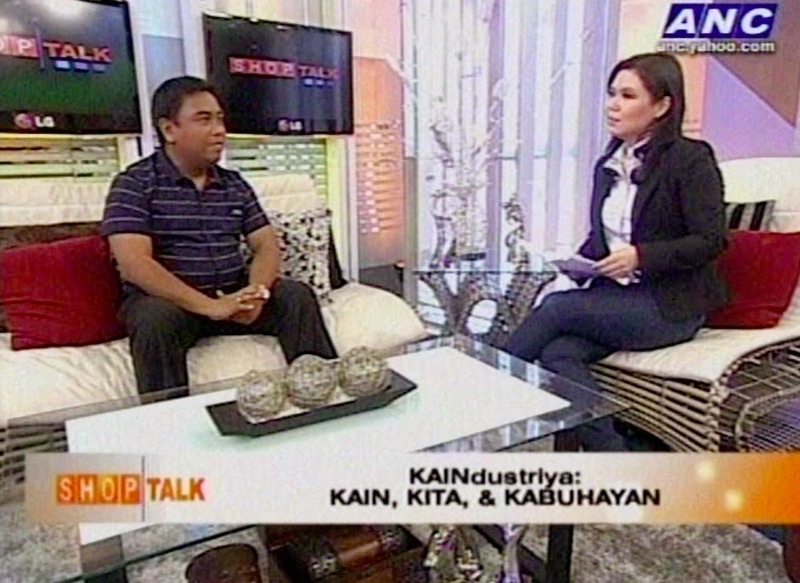 The day I quit was the day I got a call from ABS-CBN. Life is funny, noh? The next day I got a schedule for an exam, a couple of weeks later, an interview with a guy named Rommel Bernardo, then the executive producer of The Correspondents. I stayed with The Correspondents for six months before moving to ANC. What was your experience working in and for The Correspondents? Oh, wow! The Correspondents was like a crash course in journalism and life. Six months of hard work, days that felt like they had no end, transcriptions that would go on forever, deadlines you think are impossible to meet. In hindsight, I think it was my training ground — a baptism of fire as some would call it. I’ll never forget the time when I, the sheltered and spoiled one, the Disney Princess, would roam the streets of Manila and Cubao in the wee hours of the morning in search of a "lola prosti." Yep, prostitutes who were old enough to be my grandmother. I’ll never forget the cold stare I would get from people that passed me by at the footbridge in front of Acton Theater, both the fear and the adrenaline rush of just being in that moment. In hindsight, to be honest I think I was brave because I was foolish, too young and inexperienced to know fear. Then there are the stories you hear from your case studies — raw and overwhelming, and of course their hope — that in return, you may be able to give them some sort of help. I think that’s one of the biggest challenges of being a journalist — to be as humane as you can, and at the same time be detached, accepting the fact you are not there to save them, but to tell their story. In the end, we can only hope that someone out there is listening and will move. Then there’s the frustration of working on a story — finding the case study, interviewing and shooting, transcribing and in the end, have someone else complete the story for you, have the story under someone else’s byline. That taught me 3 valuable lessons: #1 it’s always a teamwork, and #2 you have to work your a** off every single time, so one day you’ll earn your place and get the chance to tell the story yourself. And #3, you gotta be resourceful, you never take "no" for an answer — there is always a way, and you have to find it. Failing is not an option! What made you want to be a journalist? What or who inspired you to pursue a career in journalism? Do you want the honest-to-goodness answer or the correct answer? To be honest, my original plan was to be a superstar! You see, the main goal was to be famous, followed by "whatever and however it takes." But my feet brought me here: the news department, the serious side of the business. I later realized I preferred telling real stories, working with no made-up scripts, talking to real people about things that matter, things that change the world, things that affect you and me. I tell you: I was at the right place, at the right time, and met the right people. I was pretty lucky! So there I was with one foot in the news department door. I told myself: I’m here anyway, might as well try it out. But first I needed to find a model — someone who I can look up to in terms of depth and style. I opened the TV and decided I like Christiane Amanpour’s authoritative and serious questioning style, Diane Sawyer’s interviewing skills and Anderson Cooper’s very down-to-earth and common sense kind of tone. And when you’re there, in the middle of the newsroom — in the frontlines of what is happening — it’s not very hard to catch the momentum. Looking back, I think I've always liked talking. As a child I would even pretend to talk to make- believe people (students, whenever I pretend to be a teacher; guests whenever I put on my waitress hat). I would pay attention to the sound of my voice, and critique myself, then start all over again. So I guess the signs were there! [laughs]. From mainstream you jumped to cable news. Tell us more about your early days working on ANC. I think having a strong show like The Correspondents on your resume really does a lot to boost your chances of landing a job. So after 6 months at The Correspondents, I got hired as a junior writer for ANC, under Glenda Gloria’s time. During the interview, I shamelessly went straight to the point and told my boss I wanted an on-cam job. Of course I didn't get it right away. That big break would come 2 years later and I had to prove my worth, too. At least with ANC, we have a fixed schedule per shift, unlike The Correspondents where you literally had no schedule at all. How did the weather presenter gig come about? I got a surprise text from my news manager that there was an opening in the weather department because our presenter and my friend, Bettina Magsaysay, was getting promoted to TV Patrol. I took the shot. Did a couple of weeks of weather script-writing submissions, 1-audition VTR, and eventually 2 weeks of on-cam training with the chroma board. 2-3 months later, the bosses called me and told me they were giving me a shot. I will never forget that moment, I wanted to hug everyone in the room! Only a few close friends know this actually — had my news manager not text me about a weather audition, I would have probably quit ANC within that month or the next. The weather audition pulled me back in at a time when I felt my career was going nowhere and I was already set to do business work. Life is really full of surprising turns! And as cliché as it may sound: things really do — eventually fall into place. [laughs]. How do you prepare your daily weather reports? I start researching around 5PM everyday, around the time PAGASA releases its latest forecast. Then I check other weather forecast sites to compare what we have and what they have. Most of the time, I give PAGASA a call to get specific details and to clarify some data especially when there are stark differences. Then I write my script. At around 6-6:30, the script gets sent to our graphics artist who does wonders in translating what would have been boring numbers into interesting moving pictures. So far, what's the biggest meteorological/weather event you have covered? As a weather presenter, It would have to be Yolanda 2013. We knew it was coming, we’d been reporting it for days before it actually happened and yet, it still caught us off-guard, not the forecast but the impact it was going to have. There are days I still wish I had stressed the "warning about storm surges" more. As a journalist, Ondoy would be the biggest. At that time I was still with The Correspondents. I was sent to Rizal where we shot case studies. I can still remember bodies, sometimes body parts, all covered, hardened by mud on the ground. PAGASA recently earned praises for its accurate forecast of Typhoon Hagupit. What do you think the bureau should do more to improve their weather forecasting? Our PAGASA partners are heroes. I think we often forget that fact. They work day and night to keep us informed. They help save lives. I think the improvements would boil down to better technology that can guarantee that systems do not fail when they are needed the most. To be fair, we have been making big gains on that front too! Project Noah has been effective so far, as long as it doesn't get bogged down because of web traffic. What I think PAGASA and weather presenters have to do is work together to come up with ways on how to better explain and humanize weather concepts. Think BBC’s Wild Weather. I only heard about this show recently but it sounds like something we need. For example: when we say 10mm of rainfall, how much rainfall is that exactly? Enough to fill a swimming pool in an hour? What exactly is the difference between light, moderate and passing showers? How would you describe your own style both as a writer and a news presenter? I try to be casual and conversational. I don’t want to be a cold face reading the news. My hope is that viewers see me more as a friend they want to catch up with, someone they can connect with. The news is a living, breathing thing. More than giving information, I hope the viewers are able to catch my vibe — to feel and to remember that feeling every time they watch me. I want them to feel the excitement I have when we count the days to summer or how we monitor every drop in temperature in anticipation of the Christmas chill, or the anxiety and worry I feel when monitoring a potentially devastating typhoon. At the end of the day, I just want to be a part of the viewer’s day, relevant to his life and the choices he will make for the day. Plus, of course, hopefully be able to bring a bit of sunshine wherever the viewer is. Among our local anchors and reporters, who do you watch the most and why? Also, who do you look up to in this business? I have two. Coco Alcuaz whose work ethic I really admire. This guy is very smart and he does his homework. Sometimes I feel he knows everything. And in the few times he doesn't know, he has a way of simplifying things, breaking them down until the elements make sense alone and together. I think he finished Philosophy or Theology. No wonder. [laughs]. Now that is a "thinking" anchor. And the best part, he has the patience to mentor newbies like me! Another is Karen Davila. I like how she reports and interviews with flare. I think she has the rare ability to fit in anywhere — both local and cable news crowd. [laughs]. And she’s very hip too! What are some of your skills and personal traits that helped you get to where you are right now? Persistence, persistence, persistence. Just keep pushing! When the going gets tough… keep walking! You had a chance working with the legendary Tina Monzon-Palma on The World Tonight? How was it like working with her? At first, scary. Of course, you’re with the Tina Monzon-Palma, you better measure up and deliver. She doesn't just read the news, she knows the news, so you better have an answer when she starts asking the whys and the hows, and the answers better be good or she will grill you. Nobody gets away with generic answers. This lady has been there, literally there — as in almost everywhere — and done that so she knows if you have no idea about what you’re saying. But in light moments, she is just a doting lola and mom. She absolutely adores her children. She also has a good sense of humor, my goodness! And because we are seatmates, with just Sir Coco in between us, we get to chika too sometimes. [laughs]. Some things we talk about: making critical editorial judgments on air, good restaurants to try, a visiting friend, the weather in the area where she is building a school and detached involvement (yes, she gives great love advice!). You're also the EP of Inside Business and News Now. How do you shift from your news presenter hat to your EP hat? Well, one big difference is I do the producing with no make-up on. [laughs]. But as much as possible, I try to always do the best I can in whatever I do. You know what they say, your last project or in our case, last newscast, is your updated resume. I’m actually very lucky, I get to enjoy the best of both worlds doing the off-cam production work (from PA, to coordinator, to writing to sitting through editing), and the on-cam work. To be honest, I think my EP job helps keep me sharp. I am forced to understand things, to know things and I think this helps me become a more effective communicator. Also, I guess the perspective is different. As an EP you need to take a macro-perspective, you manage not one story but one whole production lineup. As a presenter, you only have to manage your part and make sure you say the right things on-cam and don’t look stupid doing it. As EP, you understand that you are responsible for your anchor. You have to take care of your anchor on-air, help make them look good. As a presenter, you prepare your piece and trust that your EP will take care of you on-air. There’s a lot of trust there. And how would you describe your style as producer? Oh, I’m very easy-going as a producer. My anchor happens to be the thinking anchor. He’s very hands-on, he knows his craft so well. It’s very hard to ‘bola’ him into following everything I say. This is good. We get to exchange ideas about how to make the show better. But of course, you can’t avoid disagreements and having to put your foot down. But you grow. That’s how we all learn. I think chemistry in the team is also very important. They just promoted you to an even bigger position as stock market reporter. Could you tell us more about your new role? Basically, I'm gonna keep watch over your money. At least I'll try. I'll make sure the audience is updated with the latest happenings on the economic and corporate front. I will try my best to ask the right questions, get in-depth answers and hopefully guide you as you grow your money. Many people might think business or stock news is boring, ah, but they are wrong. It's full of drama — life-changing drama. The characters are real, the plot is very exciting. Indeed, truth is stranger than fiction. Galing! Business is everywhere. It's what you eat, why the brand you're wearing is expanding or why one of your friends lost her job. It's all connected, run by businessmen whether you know them or not. Knowing business news, you'll get to see things in a different light. You begin to make sense of the most ordinary things in your day to day life. Personally, this is a very exciting next step in my life — a goal I've been chasing for years, and now I am here. I will do my best! I don’t like that we don’t have holidays. [laughs]. When most people stay in during a typhoon, that’s when we’re expected to go out. We kind of live a different life cycle in the newsroom. But that’s the nature of our job and you learn to like it. [laughs]. The best part about the job: It’s always a learning experience. No such thing as a boring news day in our side of town! How would you describe one of our 2014 media winners, your boss, Ms. Ging Reyes? From what I know of her, she’s a no non-sense kind of person! Very straightforward, she won’t do the “paligoy-ligoy” and “pasikot-sikot” with you. I've been to her office a few times to get advice about some things. It seems that she always has a simple answer and solution. [laughs]. I really like people who keep it simple. Oh, everybody is just so proud and supportive. I tell you, when I got into the business, I wasn't the only one. My whole family went with me! [laughs]. That means fixing everyone’s schedule to accommodate mine, moving family dinners and celebrations just so I could join them. And my mom, she is my number one fan. My goodness! I never thought she could be a stage mother! Sometimes I feel she has the career and not me. [laughs]. She worries about what I wear, my make-up, how I do my stuff at work — even about not-so-nice-kids at work. [laughs]. She is so proud, her phone is full of pictures of me doing the weather or the stocks. She takes videos of my newscasts too and watches them over and over again! Yeah, my mom is very big on support. Told you I am very lucky. [laughs]. Lighthearted question: Do you still have time to go on a date or hang-out with your friends with your pretty busy schedule? I keep a very small, close circle of friends eh. I’m not really the party kind. I prefer to keep things private and intimate. We don’t even have to see each other often, but when we do meet up, it’s like we just spoke yesterday. That’s the kind of relationship I try to keep. As for dating, oh, we make time. Work-life balance yan! I’m very lucky to be with someone who is excelling at his own thing, a man of his own. He's very supportive, too! After a long day’s work, it’s comforting to have someone wonderful waiting at the finish line, ready to listen to your stories and best of all, spoil you. [laughs]. What can you consider as the professional highlight of your 2014 or the years since joining the biz? Also, what can we and the viewers expect more from you? Last year, it would have to be our coverage of the “World Economic Forum." I was the producer of Coco Alcuaz. I was also reporting and filing stories for our news programs. I can say, dyaan, nakipagsabayan kami with big international news agencies. I remember it was a whole week of business events — Asean Finance Ministers meeting (AFMIS), then WEF. Wow, back-to-back interviews with big personalities who are just visiting the Philippines for the events. It was so inspiring to hear their stories, being able to see their global perspective, global talaga kung global. You realize there are so many ways to see one thing. You also realize how big the world is, and how small you are and at the same time, how so many opportunities surround you. The world really is for the taking. Galing! I was so excited the whole time, I didn't have time to be tired. What do you want to achieve this year or in the near future? How about hosting your own program? What are your career goals? 2015 is shaping up to be a very exciting year for me! I cannot wait! Hopefully, I’ll be able to do more in-depth interviews, more business news reporting. On the personal side, hopefully I can start a little business and put my MBA degree to practice. [laughs]. What's the best advice you can give to aspiring journos out there? Here’s what I wish I did more of: read! Know as much as you can about as many things. Do not box yourself! Find a mentor. Work your a** off — no rest for the wicked! [laughs]. Have a strong support system and don’t forget to pray. As my dad always says, It’s always good to know where the north star is!